Early last week, Vanity Fair released The International Best-Dressed List 2014. 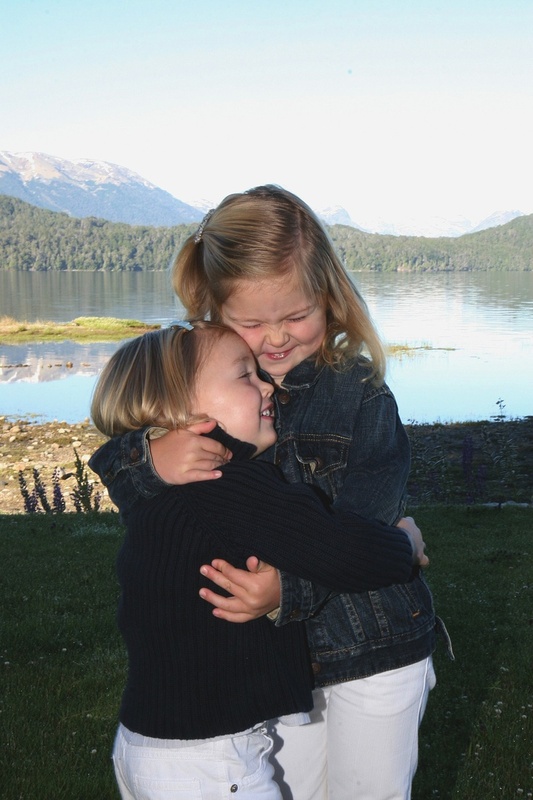 I was surprised by some of the honorees listed, especially Crown Princess Mary, and was happy to see Queen Maxima. 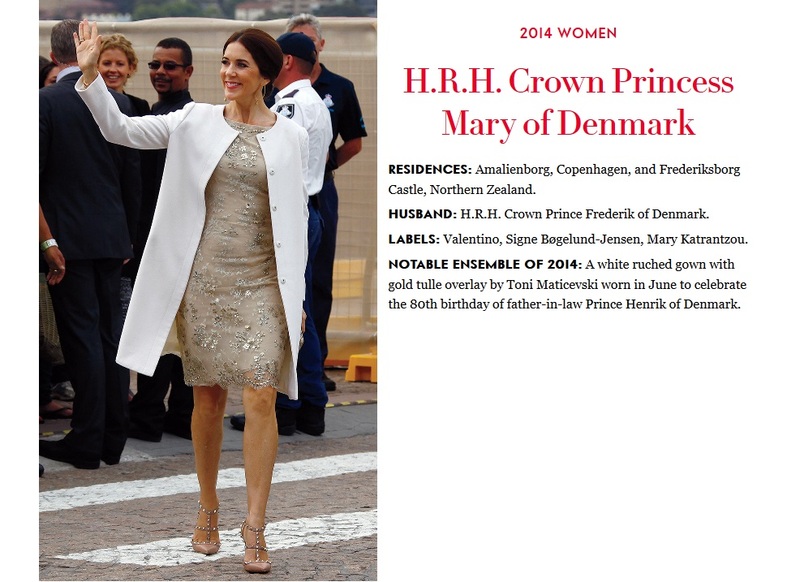 I do love the outfit that landed Crown Princess Mary on the list — pictured above — however, have found most of her outfits a bit, lackluster. Most of the time it looks like she bought her dresses right off the latest runway, and while I love runway fashion, it’s more often than not not suitable for a royal. Perhaps picking certain looks and emulating the pieces and looks that you most like, but looking like a walking mannequin does no one any favors. While I hardly think Kate Middleton has the monopoly on skinny jeans and striped shirts — I can attest to wearing them far before I ever knew of Kate, as can many. But the green jacket featured above, identical to the slanted pocket, leaves one with doubts that this was a mere coincidence. 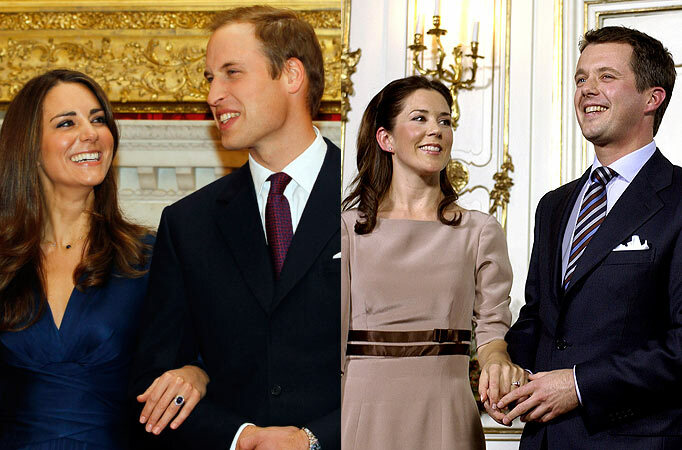 Ever since Kate hit the seen the media has been trying to push this comparison of the two “commoner” princesses narrative. 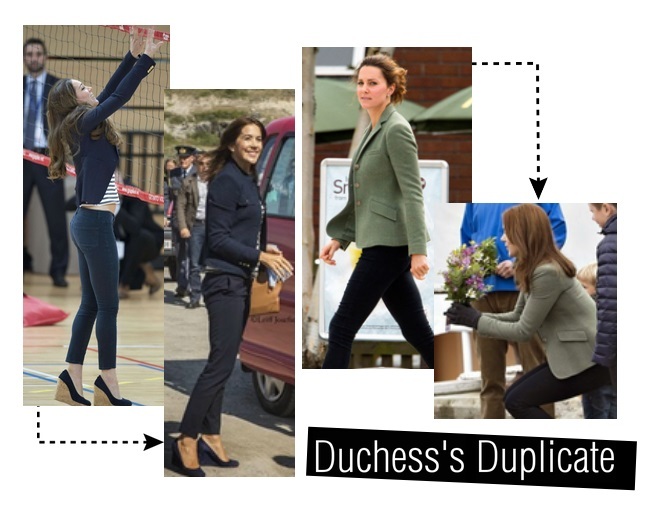 But, since Mary sometimes uses Kate as a fashion muse… and Kate sometimes looks to her late mother-in-law, Princess Diana for inspiration… it seems as though the real royal most deserving of this Vanity Fair honor should be Diana herself. I suppose that’s not the popular opinion, just my own. 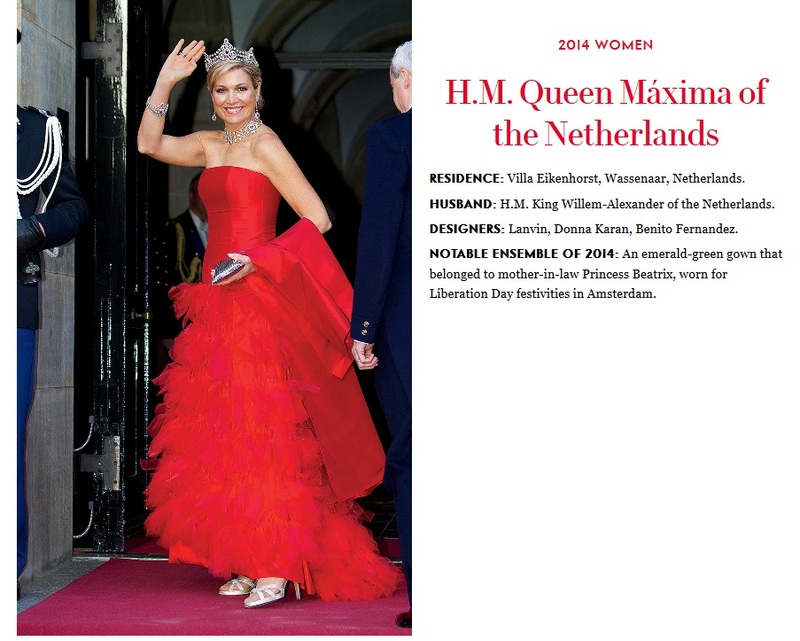 Queen Maxima, however, I am so glad to have seen listed. She seems to add her own flair to every outfit, and has the confidence to make a potato sack look glamorous. I sincerely wish we had seen Queen Letizia mentioned, though. She seems to take a lot of fashion risks, and stays true to her own style. 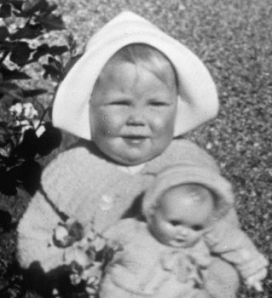 Princess Beatrix, now former Queen of the Netherlands, looking as cute as can be, 1939. 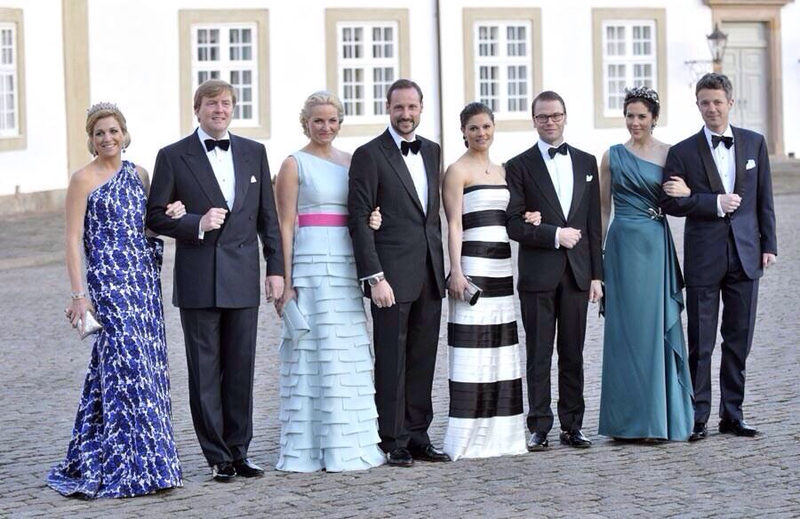 Queen Maxima, King Willem-Alexander, Crown Princess Mette-Marit, Crown Prince Haakon, Crown Princess Victoria, Prince Daniel, Crown Princess Mary, and Crown Prince Frederik gather at Fredensborg Palace for the celebration for Queen Margrethe’s 70th birthday, April 16, 2010. 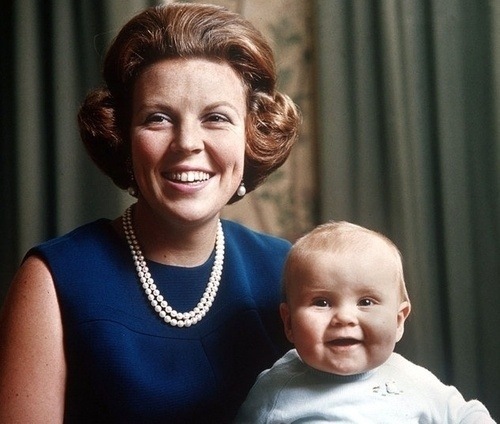 Princess Beatrix* poses with her six-month-old son, Prince Willem-Alexander*. 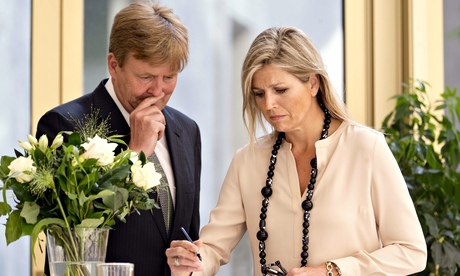 *Now she is the former Queen of the Netherlands since abdicating last August, passing the throne to her son, who is *now King Willem-Alexander.